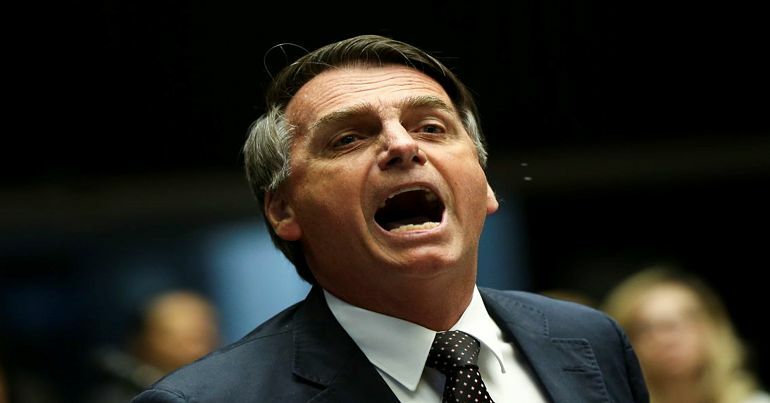 Since announcing his candidacy for the Brazilian presidency in July, Jair Bolsonaro has been perfectly clear about his tyrannical plans for the country. But with just a week to go before the second round of the election, the presidential frontrunner promised “a cleansing” of leftists “never before seen in the history of Brazil”. And while leftists are facing potential annihilation in Brazil, Western governments continue to look on in silence. This is nothing new. The West has a long history of supporting tyrannical leaders because of – and not despite – their brutal targeting of leftists. In fact, terrorising leftists has long been central to Western foreign policy. Bolsonaro’s words have alarmed survivors of Brazil’s 21-year military dictatorship, which lasted between 1964 and 1985. As the Guardian reported, these years recall “savage torture sessions” and “dank political dungeons” for those “considered leftist enemies of the state”. The military dictatorship killed 475 people (around two people per month of dictatorial rule). And it tortured 30,000 more. Bolsonaro has spoken fondly of the dictatorship, but his own plans for Brazil seem perhaps more terrifying still. If he succeeds in cleansing leftists like “never before seen in the history of Brazil”, we should expect nothing less than a humanitarian catastrophe. The notion of ‘leftist enemies’ is an echo from the Cold War, when the US developed a doctrine of ‘counterinsurgency’ to contain unwelcome economic reforms across the Third World. Throughout the latter half of the 20th century, the ‘war on communism’ was a euphemism for a war on wealth redistribution deemed threatening to Western capital accumulation. Across the Third World, the West’s ‘leftist enemies’ therefore included both communist insurgencies and civilians such as trade unionists, social activists, and community organisers. This logic of counterinsurgency warfare had disastrous human consequences across Latin America, not least in Brazil. And despite the end of the Cold War, Western-sponsored counterinsurgency warfare continued in Latin America. Bolsonaro’s promise to cleanse leftist enemies therefore complements decades of Western foreign policy. For this reason, we can confidently expect the West to stay quiet as Bolsonaro ‘cleanses’ Brazil’s domestic left. Because to put it bluntly, he would be doing the West’s job for them. History often distorts or forgets the murder of leftists, and this is likely to re-occur in Brazil. Because by controlling the memory of collective struggles, history can become a vehicle of the oppressor. Mass murders of leftists are similarly bleached from history. Most will not know, for instance, about the US- and British-sponsored massacre of hundreds of thousands of Indonesian leftists during 1965 and 1966. For the West, there are worthy and unworthy victims; and leftists are usually near the bottom of the pile. Bolsonaro’s election victory is now looking like a matter of inevitability. And as long as he leaves the country open to Western corporations, the “cleansing” of leftists is unlikely to pose a problem. In fact, “cleansing” leftists is a typical requirement for implementing Western-friendly neoliberal economic restructuring. This should be truly terrifying for all Brazilians. And to show our solidarity with Brazil’s left, we should all keep a close eye on what happens. – In the UK, write to your MP to share your concerns about Brazil. – Read The Canary‘s previous articles about Brazil at The Canary Global. – Join The Canary so we can keep resisting the advance of the far right.